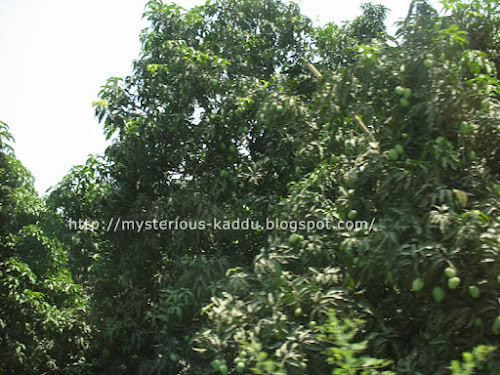 Green trees... loaded with green mangoes! Took this picture in June 2007, from a moving car. So the picture is not as clear as I would have liked. But the sight was just beautiful. There were mango trees all along the road, and every single tree was full of mangoes! This is my 17th post for NaBloPoMo March 2012. Link to the previous post: "Photo A Day: Sunglasses"
I likes. Ever climbed one? Aha! Stole any mangoes while you were up there? Amrud. Mamu pointed out the ones he wanted me to pluck and I followed. This was during my brief stay in Bandel, a distant suburb of Kolkata. The elderly couple whose front yard we were in thought it was rather unfortunate that a 12yr old boy should need a ladder to climb trees.